Roldo Rent BV in Ermelo, hereinafter referred to as the rental company, rents out the goods further defined to hirer. 1. For the rental prices and replacement values of the materials, you are referred to the Roldo Rent BV price list or other agreements made. Invoices shall be drawn up weekly and must be paid within 21 days on bank account NL05RABO0134962176 BIC: RABONL2U. 2. The materials must be returned according to instructions for returning materials. 3. Entire or partial renunciation of usage not for valuable consideration is only permitted with written permission from the rental company. 4. The rental period ends when the hirer returns the rented goods to the depot in line with agreements. The rented goods must be returned on this date, at the cost of the hirer, to the depot address, stacked in transport sets and in the order in which they were received by the hirer from the rental company. The rate for restacking shall be calculated on the basis of man-hours (see price list Roldo Rent). 5. The fixed booking-out costs per batch amount to € 19.50. The fixed booking-in costs per batch amount to € 22.00. If materials are returned dirty and/or bearing stickers, cleaning costs will be charged. The rate for cleaning shall be calculated on the basis of man-hours (see price list Roldo Rent). 6. The rented goods must be used in agreement with the intended purpose. The hirer declares to have received the rented goods in good condition, to maintain this good condition and to return the items in this condition after the rental period has expired. 7. The costs of maintenance, replacement or repair, whatever has led or given rise to this, shall be borne by the hirer. All charges and taxes in relation to the rented goods that are imposed shall be borne by the hirer. If the RFID tag is damaged, the hirer will be charged € 1.00 per tag. 8. The renting company retains the right to check usage and maintenance of the rented goods. 9. The hirer is liable for all damage caused, in relation to the rental company and subsequent hirers with whom rental contracts have been signed, if the hirer fails to return the goods on time. 10. From the moment of transfer of the rented goods upon delivery to the booking-in of the goods to terminate the rental contract, the risk in relation to the rented goods, including fire or theft is borne by the hirer; the rental company shall not be held liable for any visible or invisible, hidden or non-hidden defects. 11. The hirer is liable for all damage, however specified and caused, to the rented goods or caused by the rented goods, irrespective of whether this is the hirer’s fault, or the fault of a third party or the result of force majeure. 12. 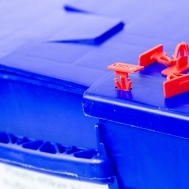 End-pieces, base plates and wire edges may not be applied to any type of plastic box. Writing on a covered element is also considered to be a loss and will be charged to the hirer. Labels are only permitted on the wire edge brand plates on the roldos, on the writing plate on the roll containers and on the specific area provided on the plastic boxes, using labels that are applied using semi-permanent adhesive. 13. If hirer fails the pay his rental fees promptly, fails to adhere to one or more of these clauses, if the hirer is served with a writ of sequestration or a writ of fieri facias in relation to moveable or immoveable goods, or a part thereof, or on the goods he has rented or a part thereof, if hirer applies for a payment moratorium, if hirer goes bankrupt, if he dies or is placed in receivership, or ceases to be a resident in a State of Europe, through the course of the set period or as a result of one of the above situations, the renting company retains the right, without further notice, to immediately terminate the rental contract, without intervention by a court, and to immediately reclaim the moveable goods without prejudicing the renting company’s right to claim payment of costs, damages and interest and without prejudicing its rights pursuant to article 261 to 279 of Book 6 of the Civil Code. 14. The hirer is committed to notifying renting company immediately of any seizure of renting company’s moveable or immoveable goods or the goods rented out to him, or a part thereof, and of his bankruptcy, his request for a payment moratorium and placement under receivership or his intention to cease residence in a State of Europe, as well as providing the seizing bailiff, the trustee or official receiver with information regarding this contract. 15. Finally, the hirer shall bear the costs of all legal and extra legal measures, which the renting company considers to be necessary or useful in order to enforce its rights arising from this contract.